As a result of frequent use by many different people potential hazards are missed, overlooked or more commonly left for someone else to report. Our Microwave Leakage Test and visual inspections will make sure that they are safe and operating within permitted guidelines. If it has a 3 pin plug on it that can be plugged into the buildings electricity supply we at EST-NW can test it. Whatever testing regime your company has decided to implement, following either HSE or IEE guide lines or even as dictated under the terms of your insurance agreement we can work with you. Unsure what PAT Testing is? Or maybe you just want to find out why you should choose EST-NW for your PAT Testing needs? 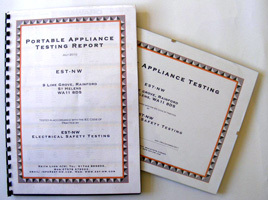 Visit the PAT Testing With EST-NW page for more information. What Plug Types Can You Test? If it is a portable appliance with a plug chances are we will be able to test it. However for the most common plugs we test please visit the what we test page. * Free plug and fuse replacement is subject to the testers discretion and will never exceed 10% of the tests conducted. If you would like to find out more about the frequency at which it is advised you should have your appliances tested please visit our testing frequency page to find out if you need to have them tested again.